Goldsmith intrigues the reader with the idea that the Bible is not a book outside of ourselves or a series of events that took place thousands of years ago. He says, "Scripture is the unfolding of characters and movements or happenings that are taking place within you – right this minute. Every biblical experience can be found in your consciousness at some time or other." We embody within ourselves every Bible of the world, every philosophy, character and story, Goldsmith says, and when spiritually interpreted, these can be understood as states and stages of our spiritual development and unfoldment. Working with Bible stories such as Creation, the Exodus, the Ten Commandments, Ruth and Naomi, and Joseph and his brothers, Goldsmith shows the reader how these really tell of our own experiences on the spiritual path, and he reveals the lessons they hold. Addressing the coming of the Messiah, a monumental theme in Scripture, Goldsmith says, "The Old Testament contains many prophecies of the coming of spiritual man, Messiah, Savior. The belief is that these prophecies referred to the coming of one particular spiritual man ... but the advent of the Christ is the coming of perfection in you and me." 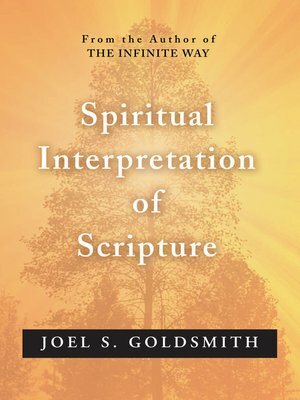 Throughout Spiritual Interpretation of Scripture, Goldsmith offers fresh new meaning to many Bible passages and stories and demonstrates that the principles found in the Bible are echoed in many other Scriptures of the world. "These statements in the Bible," he says, "which really are laws, must become a very part of our being. They must be realized, not merely declared or stated; they must become the very fabric of our being, then we can experience the outward result."